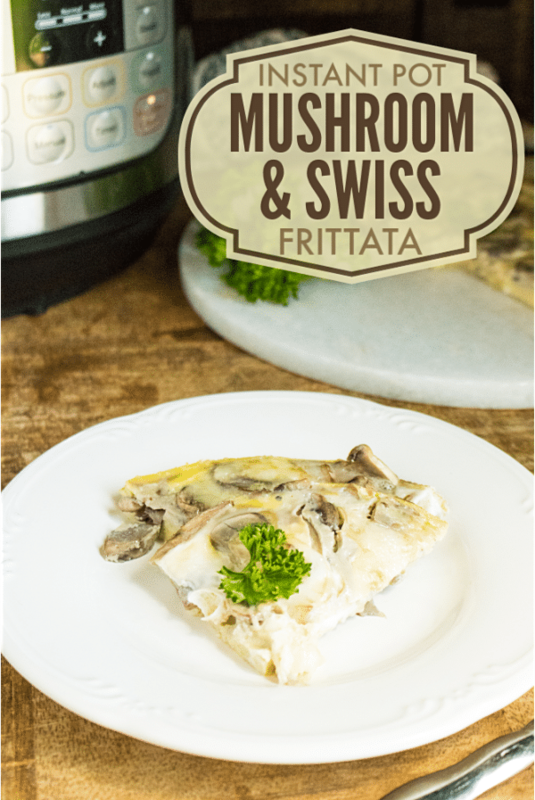 This Instant Pot Mushroom and Swiss Frittata is an awesome breakfast recipe. It’s super easy to make and is ready in about half an hour. I don’t have time in the morning to whip up elaborate breakfast dishes for my family. That being said, I also don’t like to send my kids out the door with only cereal in their stomachs to sustain them to lunch. That’s why I’m a big fan of breakfast casseroles and simple frittatas. They make it easy to feed my whole family a hearty breakfast with minimum effort. 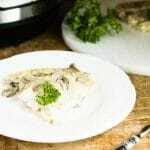 Since my Instant Pot is my go-to appliance for easy cooking, I turned to it for help with breakfast. I started with an Instant Pot Tomato Bacon Spinach Frittata inspired by my love of BLTs. Still in sandwich mode, I thought of my favorite burger when I decided to work up another recipe. 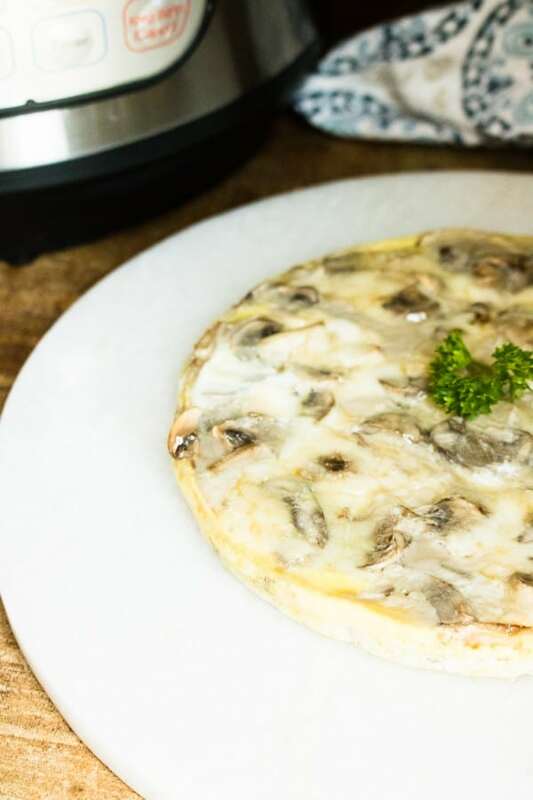 That’s how I ended up with this Instant Pot Mushroom and Swiss Frittata. I loved how it turned out and I hope you enjoy it too! I am not a fancy schmancy chef. I’m a busy mom who shops at the neighborhood grocery store and has five normal kids who eat like kids. If that sounds like you, read on. 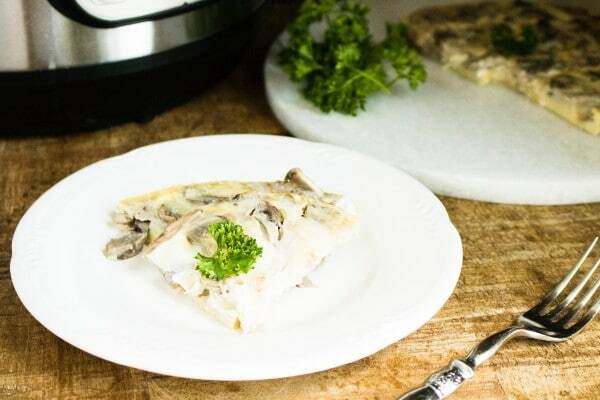 The ingredients for this Instant Pot Mushroom and Swiss Frittata are very basic. No need to visit a specialty market. You only need a few minutes to throw this frittata together, then you can finish getting ready for the day while your Instant Pot does the rest of the work. First, you’ll whisk together the eggs, heavy cream, and the spices. Next, it’s time for the star ingredient. If you aren’t using pre-sliced mushrooms, you’ll slice them now. Spray a 7-inch round pan with cooking spray, then add the mushrooms to the pan. 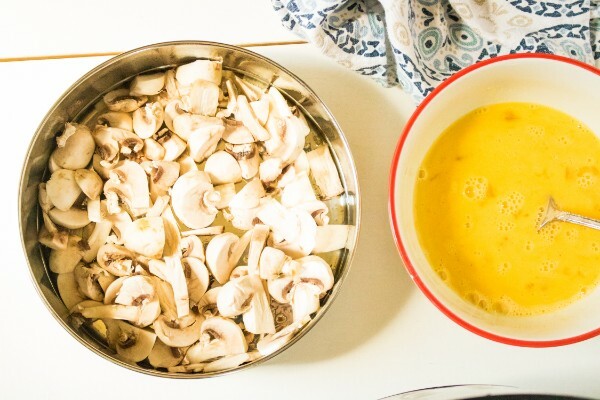 Pour the egg mixture over the mushrooms. Top with the Swiss cheese slices. 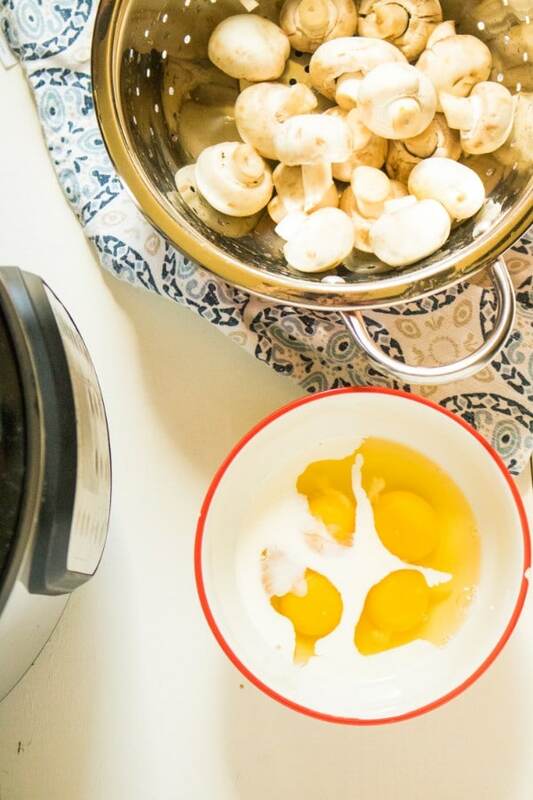 It’s time to get this frittata into the Instant Pot! Set the trivet in the bottom of the inner liner and add a cup and a half of water. Then, lower the baking pan onto the trivet. Cover the pan with aluminum foil or lid. Secure the Instant Pot lid and set the valve to sealing. Press “Manual” and set the time for 15 minutes. Quick release the pressure when the timer beeps and carefully remove the pan from the Instant Pot once the pressure has fully released. 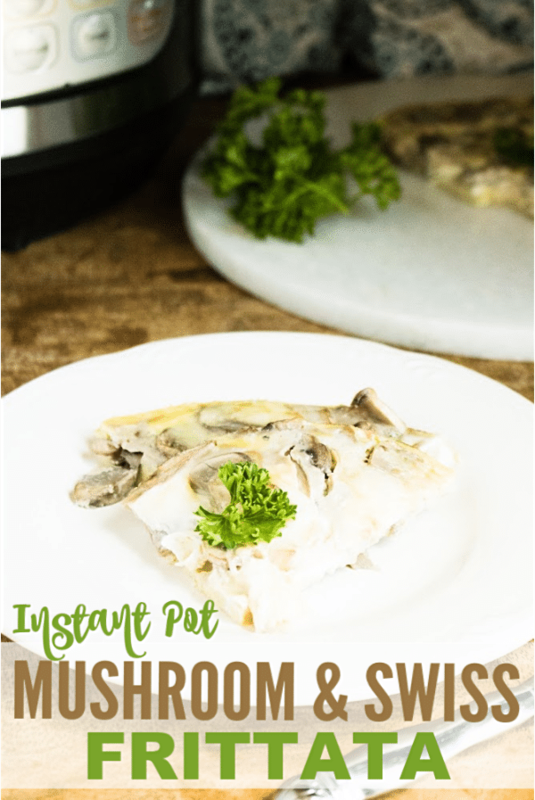 Remove your Instant Pot Mushroom and Swiss Frittata to a plate to serve. Slice the frittata as you would a pie. 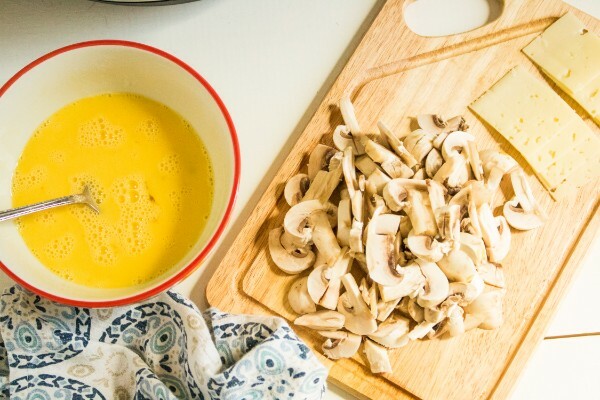 Ready to make your own Instant Pot Mushroom and Swiss Frittata? 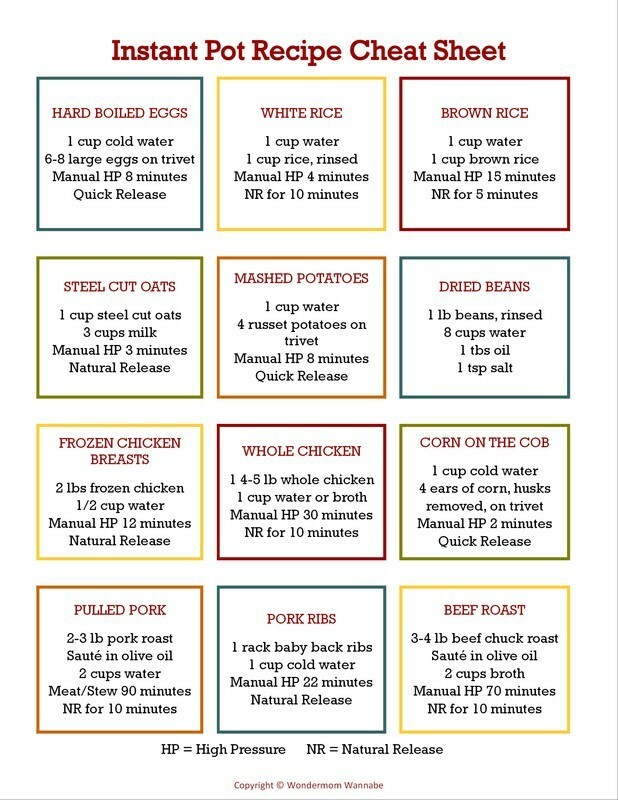 Here’s the recipe card with exact measurements. Whisk eggs, heavy cream, and spices. Spray a 7 inch round pan with non-stick cooking spray and add mushrooms to the pan. 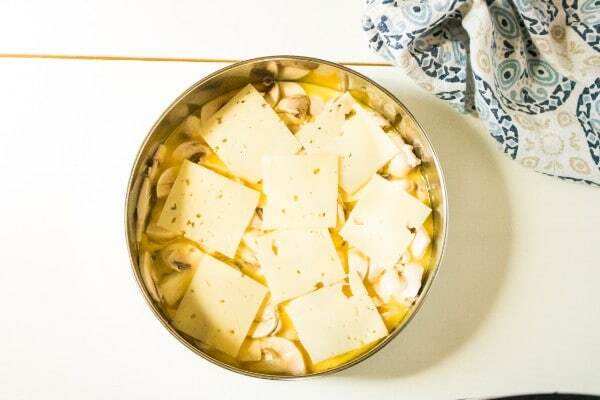 Pour the egg mixture over the mushrooms and top with slices of Swiss cheese. Cover the pan with aluminum foil or lid. 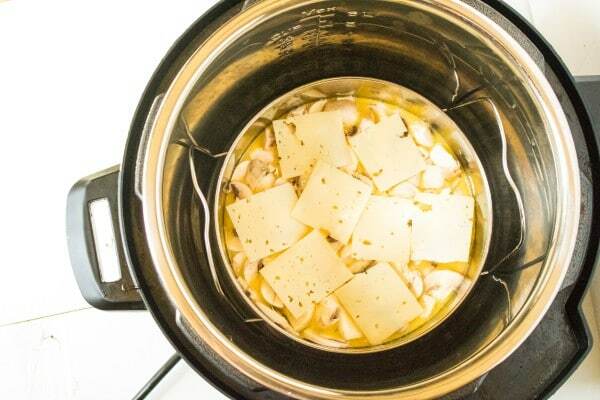 Add 1 ½ cups of water to the Instant Pot. Place pan on a trivet and lower into the pressure cooker. Set to a manual high time for 15 minutes. When the cooking time has finished, do a quick release and then remove the pan from the Instant Pot.